In the previous post in this series, we concluded with a promise to publish Part 2 within a day or so, and that it would focus on the "Modern Era" of Ufology. Here we are, several weeks later, finally posting Part 2. Since we have already broken the timeframe part of the promise, we have decided to make it a clean break and change the subject of the post as well. Some readers have utilized the large amount of time between posts to ask why we used the term "Modern Era" for something that, as far as they knew, was purely a modern phenomenon and therefore needed no distinction from past eras. As such, this post will focus on answering that question using one of our favorite question-answering techniques here at NCSI: rendering the question irrelevant by showing that one of its assumptions is invalid. 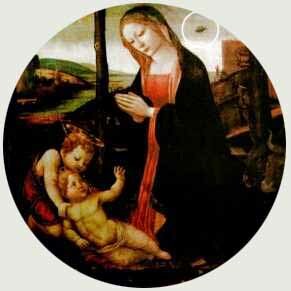 To do that, we need to give a brief demonstration of historical UFO references stretching back into antiquity. Enough small talk, let's get to it. "The globes, crosses and tubes began to fight one another, and this went on for an hour. Then they all fell to earth, as if on fire, and faded slowly away producing a lot of steam. 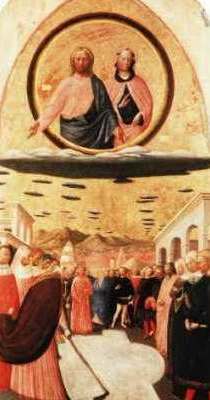 Afterwards, a black spear-like object was seen, and the whole event was taken to be a divine warning." 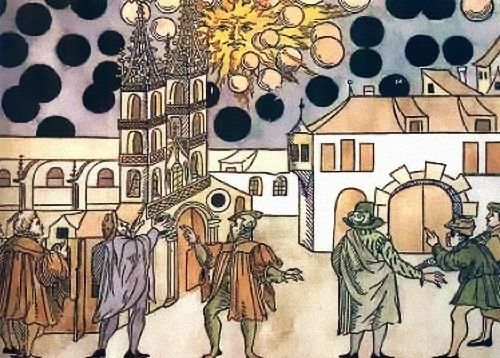 It is another woodcut/broadsheet image, this one by artist Samuel Coccius, and depicts the many "flaming" and "large black globes" that were reported by witnesses in Basel, Switzerland in 1566. 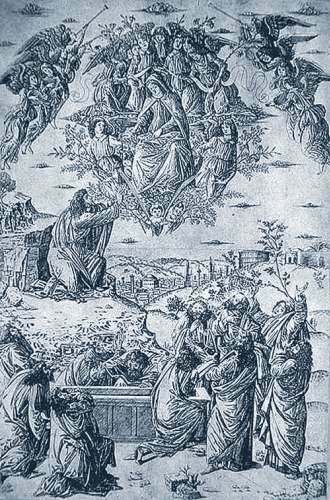 "The Assumption of the Virgin" from 1490. Interesting weather they're having, isn't it? 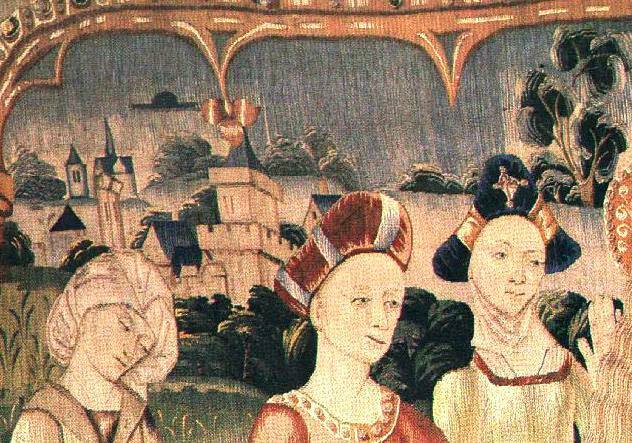 One can imagine the meteorologist's report, "Today will be partially cloudy, with a slight chance of abduction towards evening..."
This is a section of tapestry from the French Basilica Notre-Dame in Beaune, Burgandy, titled "Tenture de la Vie de la Vierge" or "Hanging(tapestry) of the Life of the Virgin" by an unknown artist in 1330. Our interest is in the object in the sky on the upper left. This "hat-shaped" object is one of the best examples out of many that have been found in classical and medieval art. It is certain that in most cases, these "hat-shaped" objects actually are hats, or have some other mundane explanation...but this one is distinct and is most definitely not connected with any other object or structure in the image. It is quite clearly meant to be part of the deepest layer--the sky in the background--which makes it as large or larger than any of the buildings depicted. This one is somewhat amusing. These two images are taken from a 12th century text entitled "Annales Laurissenses" ("The Annals of History and Religion" roughly). 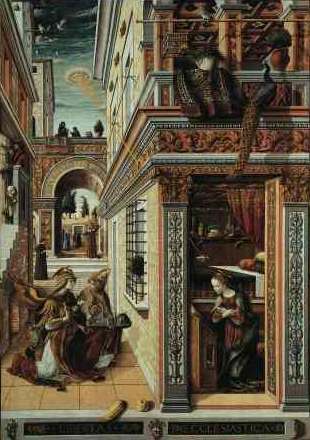 The text accompanying the images describes an incident in France in the year 776, some three-hundred years before the manuscript was written, so we may assume the author was not an eyewitness(unless he was an accomplished Alchemist), nor was he able to speak to any(unless he was an accomplished Necromancer). 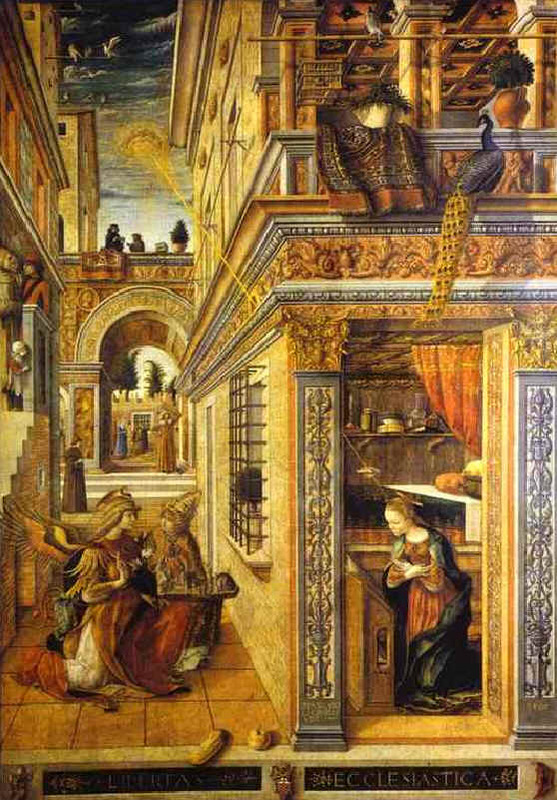 Presumably, the Annales was a compilation of church records, as the monks and clergymen were usually literate to some degree and were tasked with keeping track of events by maintaining written records. This particular account details the Saxon Crusaders siege of the French at Sigiburg Castle. 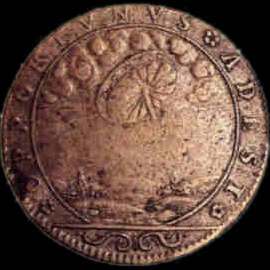 The Saxon army had surrounded the castle, and the siege was well under way when objects described as "flaming shields" began to appear in the skies above the castle(and specifically the castle church, as duly reported by the faithful clergy). The Saxons apparently assumed the objects were there to assist the French, and the entire army dropped the siege and fled, while the French stood at the ramparts and hurled jeers, curses, cows, and insults involving hamsters and elderberries. The 1784 annual Philosophical Transactions of the Royal Society includes a report accompanied by the artwork above by one of the founders of the Royal Academy, Thomas Sandby. Thomas, his brother Paul, and two other witnesses had observed a "luminous object" in the skies above England while on the terrace of Windsor Castle on the 18th of August, 1783. At approximately 9:45pm, an oddly shaped "oblong" cloud was noted moving parallel to the horizon. 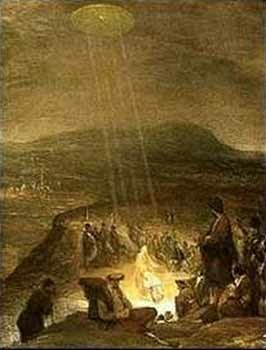 Under this cloud was a luminous object which seemingly enlarged and brightened until it was a brilliant sphere that gave off "prodigious light, illuminating everything on the ground." At that point it halted and hung motionless for a moment, radiating a pale blue color. Eventually, it took off to the east, the acceleration preceded by a pulse-like increase in brightness. The object abruptly changed direction several times, moving parallel to the horizon and then finally disappearing off to the south-east. Another report from the Philosophical Transactions, this one from 1742. This sighting was made on the 16th of December in that year and the witness included a written account along with a sketch of the object he observed while walking the Parade in St. James' Park in London. From "Ume No Chiri" or "Dust of Apricot," published in 1803 in Japan. The illustration is part of a report of a "foreign" ship seen at the Haratono shore in the Ibaragi Prefecture in Kanto on the island of Honshu. 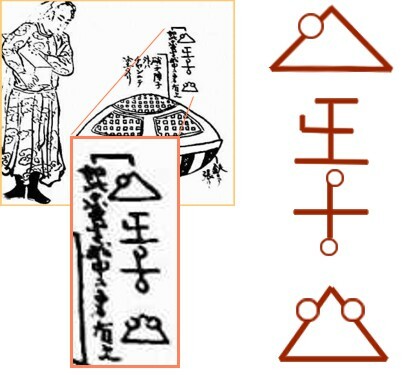 The Japanese script in the drawing indicates the outer shell appeared to be made of "iron and glass." We here at NCSI have taken particular interest in this image because of the glyphs on the upper right, which were apparently seen either on or inside the ship. While we do not pretend to have a translation for these symbols(though we may have some glimmerings of possible meanings), their appearance and style brought to mind another report that included a landed object(as this one seems to have been) that was small enough to look down at while standing, and on which glyphs were noted and recorded by the witnesses...only this report is from the U.K. in the year 1980, 200 years and 6,000 miles away. 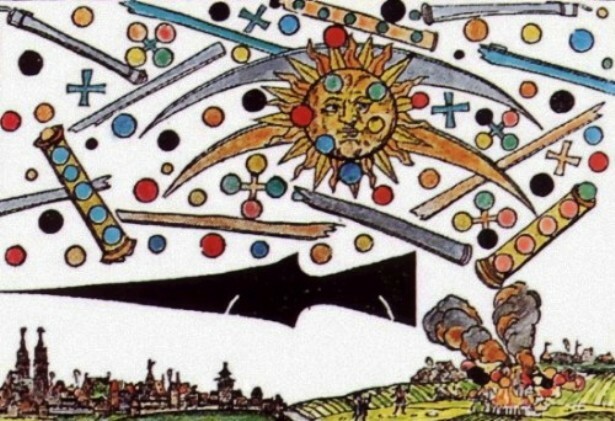 It is of an extraordinary event that took place at USAF occupied RAF Woodbridge in Suffolk, England and was recorded primarily by eyewitness Lt. Col. Charles I. Halt. It is one of the most well-known and solid UFO cases of all time, containing reports of over 80 military personnel as eyewitnesses and includes sketches, plaster casts, Geiger-readings of the landing area, and copious notes and documents of the internal investigation. It is sometimes referred to as "Britain's Roswell," and is formally known as the Rendlesham Forest Incident. Rendlesham will be detailed later in this series of NCSI docs. 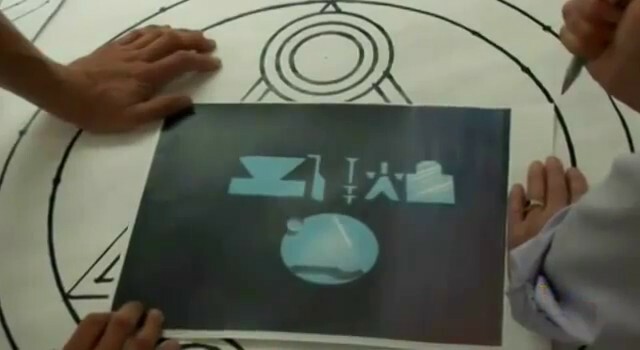 For now, we only want to look at the glyphs from the Rendlesham report from Halt's field notes, which were later digitally reproduced and blown up for study by a cryptologist(who also gave a very interesting report on the glyphs, which we will return to along with the Rendlesham incident). These glyphs are much better rendered, and there is no exact match, but the graphical styles are very similar--simple geometric combinations. In particular, note that both sets make use of the small circle overlapping the outline of larger shapes. More from Japan. 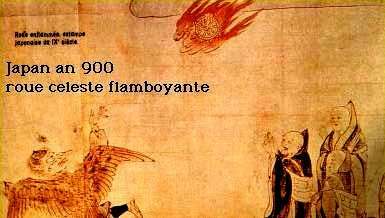 This one is an illustration of reports of a "burning wheel" sighted over Japan in the year 900. 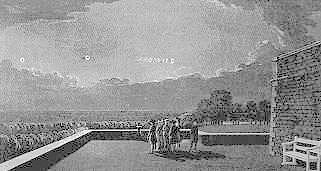 The Vedic texts of ancient India are full of accounts of "vimanas" which are alternately palaces or temples or flying vehicles. There are some whole passages that deal with construction and maintenance and operation of a vimana, including what materials should be used to build one, what clothes should be worn when operating one, and advice on what kind of meal to eat before spending a day flying your vimana. In the text known as the Ramayana there is a passage that reads, "The Pushpaka chariot that resembles the Sun and belongs to my brother was brought by the powerful Ravana; that aerial and excellent car going everywhere at will .... that car resembling a bright cloud in the sky ... and the King [Rama] got in, and the excellent car at the command of the Raghira, rose up into the higher atmosphere." The Mahabharata tells of conflicts between gods who are said to have settled their differences apparently using weapons as lethal as those we have now. Apart from 'blazing missiles', the poem records the use of other deadly weapons. 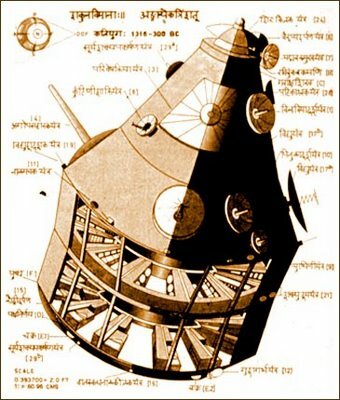 'Indra's Dart' (Indravajra) operated via a circular 'reflector'. When switched on, it produced a 'shaft of light' which, when focused on any target, immediately 'consumed it with its power'. "Gurkha flying in his swift and powerful Vimana hurled against the three cities of the Vrishis and Andhakas a single projectile charged with all the power of the Universe. An incandescent column of smoke and fire, as brilliant as ten thousands suns, rose in all its splendour. It was the unknown weapon, the Iron Thunderbolt, a gigantic messenger of death which reduced to ashes the entire race of the Vrishnis and Andhakas." 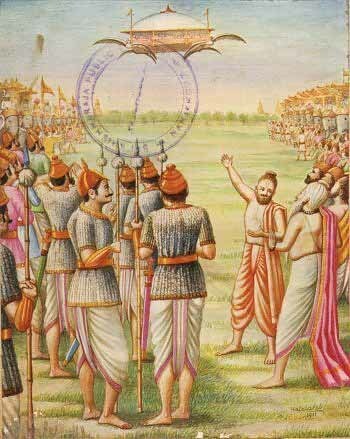 In the Sanskrit Samarangana Sutradhara (Literally, "controller of the battlefield"), it is written, "Strong and durable must the body of the Vimana be made, like a great flying bird of light material. Inside one must put the mercury engine with its iron heating apparatus underneath. By means of the power latent in the mercury which sets the driving whirlwind in motion, a man sitting inside may travel a great distance in the sky. 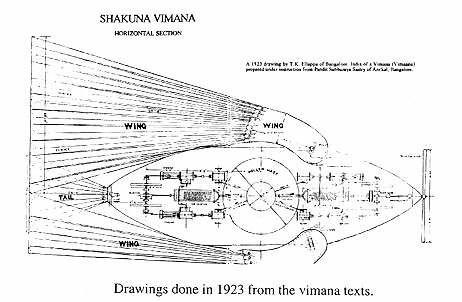 The movements of the Vimana are such that it can vertically ascend, vertically descend, move slanting forwards and backwards. With the help of the machines human beings can fly in the air and heavenly beings can come down to earth." Here are a few more such images for your viewing pleasure. 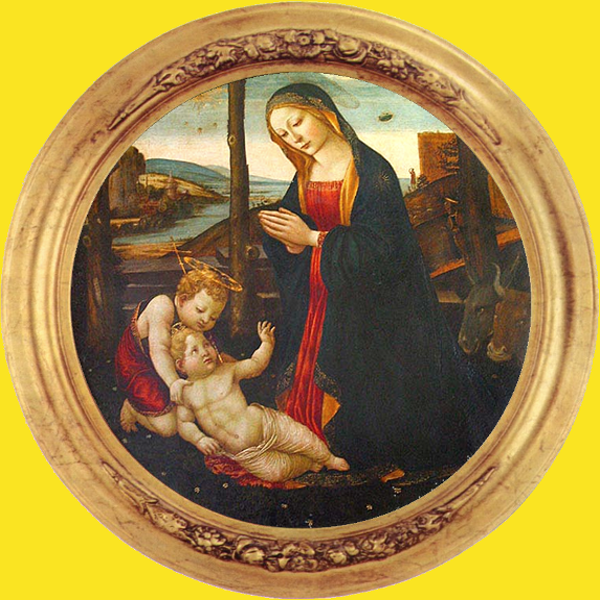 Some may or may not be simply religious iconography. Even so, they delineate an ongoing interest and cultural acknowledgement of extraordinary events in the skies. 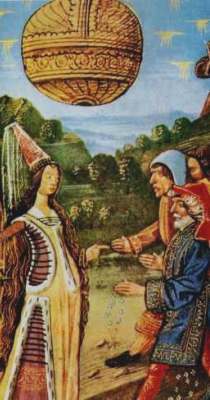 With that, we feel we have successfully defined several pre-modern eras of Ufology, and can therefore move on to the next document in this NCSI series, "Ufology Part III: The Modern Era." 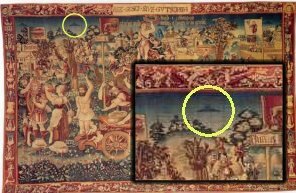 History has shown us that this phenomenon, whatever it may be, has been with mankind for a very long time, but only now are we beginning to approach a technological sophistication with which we might begin to find some real answers, and so we shall take a look at the recent history of sightings up to the present day. History has also taught us that it might be best not to give out promises as to the release of the next part in this series...so we will say only that it is already in the works, and it will be released. Until then....keep your eyes on the skies!